San Francisco, get off the Google bus and join us! Gentrification is nothing new to San Francisco. One could argue that it’s been alive since the incipient stages of colonisation. From the Gold Rush to the 90s dotcom boom, longtime residents of the hilly city of Saint Francis have been finding themselves pushed out by upwardly mobile classes, all thanks to people out to make a profit – accumulation, if you will, by dispossession. Over the last few years, the city has seen displacement skyrocket at an unprecedented rate. No-fault evictions – evictions enacted by landlords due to no fault of the tenant – are up 85% over the last three years. The most insidious of these, Ellis Act evictions, are up 175% over the last year. Conceived in 1986 to allow landlords in rent controlled areas to exit the market, the Act is now being used to evict longtime rent-controlled tenants and create luxury housing. Landlords often threaten tenants with Ellis Act evictions, and then bribe them out of their homes, only for ex-tenants to find they cannot afford new housing. 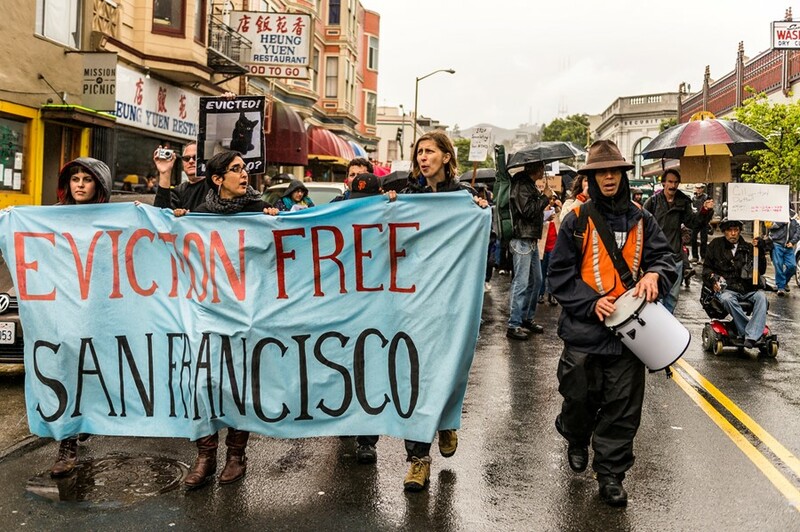 Communities on the ground know that this sea change of evictions is directly correlated to the Tech Boom 2.0. The closer a unit to a tech bus stop, the more valuable it is. 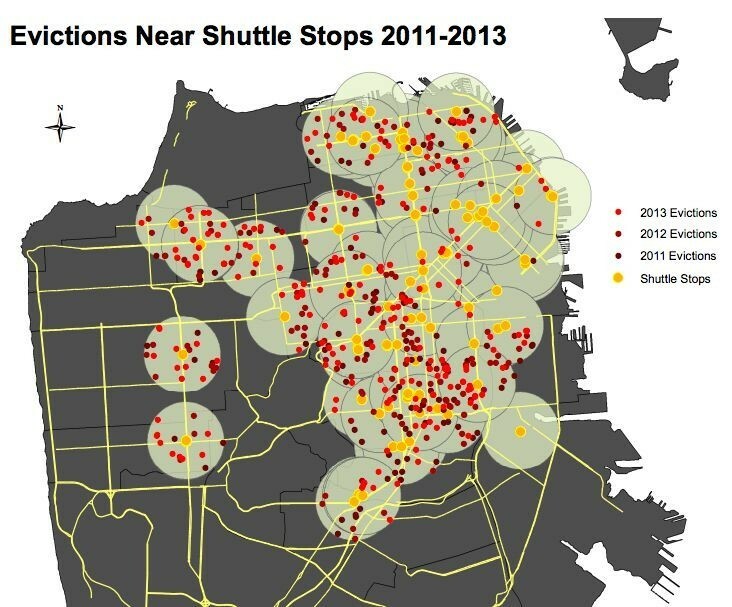 Sixty-nine per cent of all no-fault evictions conducted between 2011 and 2013 were within four blocks of a tech bus stop. While Google buses aren’t literally roving down city streets and yanking people out of their homes, the real estate industry is taking advantage of the money that tech brings into the city. San Francisco has long been hospitable towards newcomers. It’s a sanctuary city and a historic refuge for political refugees from Latin America. It also has long been a haven for queer and trans communities, as well as Chinese, Vietnamese, and Filipino immigrant communities. Those communities are now worrying now they’ve been too welcoming of tech newcomers. Displacement is only happening because the real estate industry finds it lucrative to replace locals with the kind of people who ride the Google bus. If you live in the Mission District, you see more private tech buses picking up their workers and shuttling them to Silicon Valley than you do public buses. You see families packing up their suitcases, and lugging them down the streets, while mostly white and male tech workers queue for luxury buses. You see these tech workers come back at night, interested only in frequenting the hippest, newest restaurants. Small mom and pop businesses are folding left and right, because the new locals have no interest in them. This is the political economy that San Franciscans like me were protesting when we began blocking tech buses. Our protests have been somewhat successful in calling attention to the systemic injustice that the tech industry is a part of. When even mainstream publications like USA Today casually utilise the discourse of “ruling class” and “gentrification”, I can see that we’ve been successful in at least igniting conversations around class struggle. We’ve also engendered what some call “tech guilt”. Tech workers are realising that their industry is not as benign as it seems; not only are tech companies implicated an array of rightwing actions like NSA surveillance, but tech is also partly responsible for local displacement. Annoyingly, some tech employees are trying to make themselves the victims, complaining constantly about how much they feel hated. Sarah Slocum went as far as snivelling about how being attacked for wearing Google Glass amounted to a hate crime. But the real victims are people like Alex Nieto, a Latino student who was murdered by the police while eating in a park. Subsequent protests have explicitly linked his death to the effect that tech has on the local community: any locals who spend time in that park would have recognised Nieto. A new settler, like the one who complained to the police that Nieto looked “suspicious”, would not. Because tech is, and long has been, in the business of marketing itself as "cool" and "DIY," many people have been shocked that the anti-displacement movement has found grievance with the industry. From private members’ clubs like the Battery to luxury buses, tech exudes a self-image of being cutting-edge, hip, and elite. The industry pours money into marketing itself as benign. Perhaps this is linked to tech’s dominance over the dissemination of discourse. From social media to Google Glass, the industry controls more of our communications than any other industry. Facebook and Twitter have become the default public commons; Google has become the default messaging system and research arena, and Apple provides the means to access these tools and spaces. By controlling information, tech companies continually reify their industry as a theatre in which the down-to-earth, nerdy and fundamentally well-meaning tech worker is employed. But the industry also evades publicizing their backroom handshakes, flawed research and tax evasions. A 2012 Thompson-Reuters report from last year revealed that Google’s effective tax rate on overseas earnings was 2.6% on $5.8 billion in profits. But if there was a competition in dodging, Apple won: they paid only 1.9% on $36.8 billion. These companies employ the same dodgy schemes when they avoid paying to use San Francisco’s public infrastructure. Despite the outcry over these companies using public bus stops for free, they now only have to pay $1 for each stop. During one of our recent protests, we flew a banner that read: “Get Off the Bus, Join Us.” In a recent Model View Culture article, I described ways in which tech workers can help the anti-displacement movement. Today, as my sister rides her bicycle to work, dodging tech buses and demolition sites where new housing and offices sprout overnight, I begin yet another day of organising with tenants facing evictions. Soon I’ll go to meet a friend, Benito Santiago, who is currently being evicted. Benito is a disabled Filipino senior who was born and raised in San Francisco. He teaches for the school district. I first met Benito when blocking an Apple Bus back in December. We’ve been protesting real estate and tech together ever since. No app will keep Benito in his home. No app will make tech workers more mindful of the impact that their industry has on local communities. But more importantly, no app will deconstruct the impact that tech has on my city’s political economy, because the corporate interests behind that app want to keep you in the dark.